Eclectic style comes home with our collection of worldly pattern wall murals. We’ve carefully handpicked and curated this collection to feature vibrant designs, motifs and themes from many cultures and countries, spanning many eras. 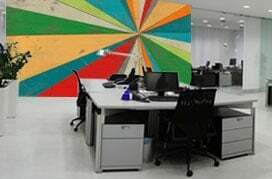 The result is an assortment of murals that offers you a multicultural aesthetic, from which you can choose the mural patterns that work best for your space. The popularity of weaving in worldly style influences is growing as a trend. You could travel to bazaars and markets around the world and bring back treasures and trinkets from exotic destinations—Persian rugs, replica Egyptian artefacts, Moroccan tiles and more. But that’s not the only way to incorporate worldly style into your space. If world travel is not in your immediate plans, you could still create a world-inspired setting with murals. 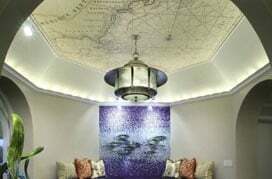 Consider a wallpaper mural with motifs that evoke the same cultures, colors, textures and patterns you wish to include. Moreover, even if you have traveled the globe and collected display-worthy pieces along the way, a mural backdrop would be the perfect way to showcase your pulled-together theme. Whether you wish to create a Moroccan-inspired space or a bohemian look, a wallpaper mural allows you to do it tastefully and almost effortlessly. Some of our worldly pattern murals feature motifs that may be traced back hundreds, if not thousands of years. These murals are a testament to the artistic traditions and heritage of many rich cultures around the world, from ancient Greeks to Native Americans. They also include more contemporary cultures, offering an eclectic mix of patterns to choose from. Complement your wallpaper mural with a rug featuring Southwestern patterns or tribal wooden sculptures from Africa and you’ll see how the mural serves both as an anchoring piece and as a focal point to your globally inspired space.